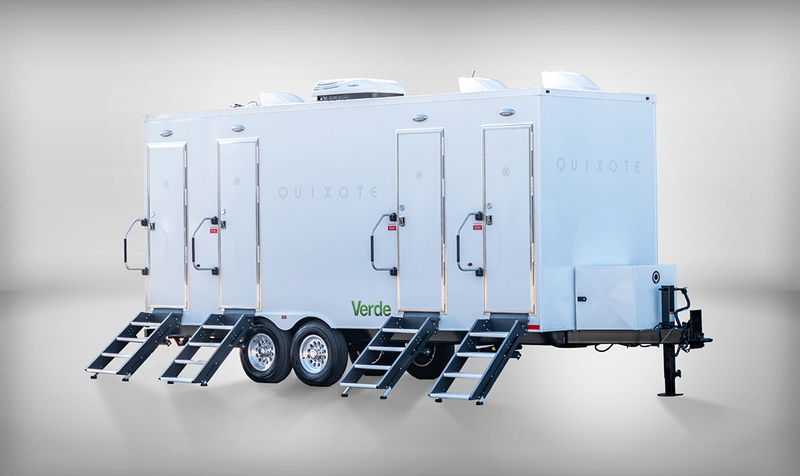 Our new, high-end, 4 room Q-loo Verde restroom trailers provide you with all the comforts of your master bathroom, on location. Passionately supplying the best studios, vehicles & equipment available. With over 20 years of experience, our studios have evolved with the times so you can play as hard as you work. At Quixote our production vehicles are an extension of our studio experience… on wheels. Improved fleet, top-notch customer service and 24-hour secured parking & returns. It’s easier than ever to get every item you need for production. Just pull into our 2 lane drive-thru & we’ll load you up. Operating from our new 40K sq ft warehouse, Quixote Grip & Lighting carries every light you need. The Quixote Expendables Studio Store is the world's largest supplier of expendables and is tax incentive qualified in 13 states in US (not just CA and GA and LA)!!! 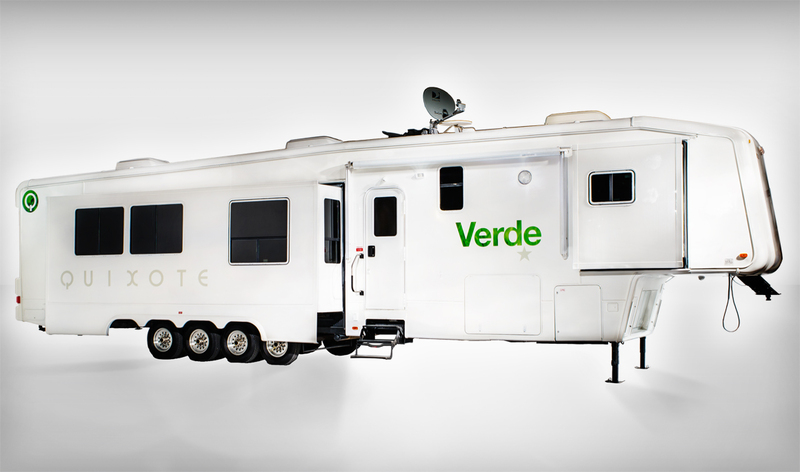 "The industry standard for a top trailer is Quixote's Verde line"
The New Standard in Eco-Friendly Celebrity Trailers. Q Verde runs on bio diesel, a clean burning, renewable alternative fuel. All the comforts of your home bathroom, on location. I have worked at Quixote for the last 10 years, as an AD and a UPM. They have always been extremely willing to do their very best to accommodate our needs whether they are last minute equipment rentals, facility and office needs or parking. The staff is courteous and knowledgeable. I couldn’t ask for a better home base. I have and will continue to recommend Quixote Studios. Quixote has all the things I need, it’s true. Motorhomes, studios, grip, electric, expendables, trucks, trailers, golf carts, ALL THE SUPPLIES. And that’s cool. But my favorite part of Quixote are the really lovely people I get to work with to get all the things for our shoot. We work such long hours and sometimes have tough days; knowing we have the support of fun and friendly people is the best. Thanks, Q! I’ve had the pleasure to work with Quixote for about 7 years and have experienced their products, services & customer support from PA to PM. They aren’t just vendors, they have become my friends. Quixote truly is an amazing company all around. Quixote has been my go-to for any and all production needs my entire career, be it a stage, or even as simple as a six foot table. The quality of the equipment is unparalleled. It also doesn't hurt that they've got the most helpful and friendly staff in the business that makes you want to keep coming back. I just wanted to give a huge shoutout to the personnel at Quixote. Seriously, it's so easy (and fun) to interact with everyone. Everybody is always so on it with emails and answers. Constantly willing to help out on deals and anything else that may arise. Everyone is so pleasant to work with. Every time. Quixote staff is the best. Period.